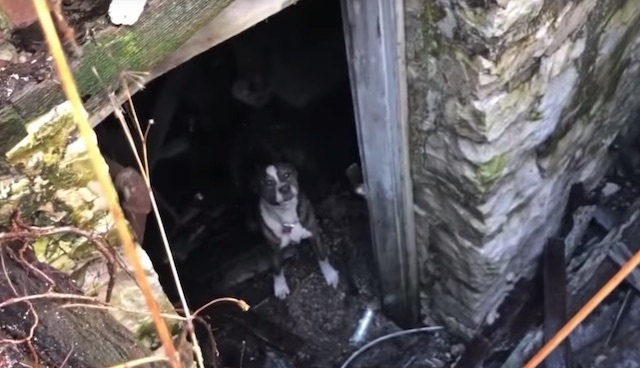 Stuck in the basement of a condemned home for over a month, Mia’s barking was heard by a stranger passing by. The rescue that followed was both uplifting and heart-wrenching at the same time. Nick Scydick happened to be in the neighborhood when he heard a dog barking from an abandoned home. He called Stray Rescue of St. Louis to tell them, and they immediately came to help. Donna walked around the dilapidated home and spotted two dogs through the grate. Going around the other side they found the two dogs at the bottom of a broken stairwell. 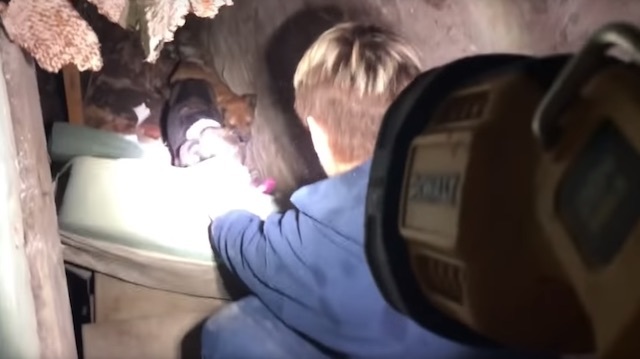 The two dogs were trapped in the basement, unable to get up. Both were emaciated but happy to see the rescuers. Using an old mattress, Donna lowered it down to the dogs to make a “ladder” for the two dogs to climb on. When they got the dogs into the car, they noticed both dogs had tags – Mia and Max. Their human mom had been looking for them for a month and was overjoyed to have them both in her arms again. But what should have been a joyful reunion took a bittersweet turn the following day when Stray Rescue learned Mia had passed away. Stray Rescue has opened a donation page in Mia’s honor and Mia’s family will be notified every time a donation is made. It’s not the ending everyone was hoping for, but we can take comfort in that Mia not only helped save her brother but also got to see her family before she went to Rainbow Bridge.